Peaceful protest: there's a lot of it about. This weekend brought news of demonstrators occupying Wembley Park Sports Ground, campaigning against plans for a City Academy to be built on the land. Faced with recent threat of eviction, the tent city teachers and other protesters are taking to tree houses to extend their occupation. The protest has already established 30 tents and a colourful garden (attracting lots of bumble bees) on the site which is regularly used by the local community and is home to Wembley Park Football Club. The protesters claim that the new Academy is not needed in North Brent, will mean loss of valuable community amenities and see £30m of public money ploughed into a private enterprise. They also point out that there is a lack of school places south of the borough and that Brent Council should have been looking to build the Academy on available land there. Brent Council say the plans are all "done and dusted" but the determined Tent City Occupiers with their community spirited 6 month stand, their very own protest rock band, admirable green intentions and marvellous views of Wembley Stadium don't seem disheartened yet. 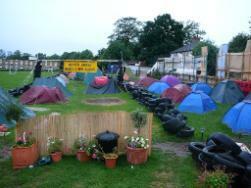 Support the Tent City Occupiers by signing their petition or spend a night on site. Image courtesy of Tent City.